It's unusual to release the second book in a new series less than year after the first but all I can say is – THANK YOU to whoever made this decision for the Frostblood Saga! I certainly didn't want to wait a whole year before reuniting with Ruby and Arcus again. 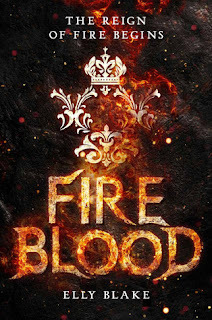 And while I was a little scared to start Fireblood, my fears were unfounded because this sequel was a solid, feels-inducing follow-up that cemented me as a Elly Blake fan. The last time we saw Ruby, she had just defeated the Frost King with help from Arcus. But the Minax is still roaming free and the kingdom itself is still in state of flux. Ruby isn't sure where she belongs but the answers she needs may be in Sudesia, the land of Firebloods. She goes there sans Arcus but instead is accompanied by Kai, a fellow Fireblood willing to help her get an audience with their queen. To her surprise, they offer her a chance to go through a serial of trials to prove her loyalty and strength. It was so interesting to see Ruby in a part of the world where her powers were praised instead of feared. It allowed her to grow as she discovered more about herself, her past and what she wanted for her future. The romantic aspect still continued to play an emotional (and favorite!) role but the choice here is again, a much deeper one. It's all about who Ruby wants to be and letting that guide her decisions. That said, I loved Ruby and Arcus even more in Fireblood and loved the introduction of Kai too. The world and lore just keeps getting better and I'm eager to find out how their journey will conclude in the third and final book! Do I recommend? Absolutely! Each book gets better and better as the author digs into the characters and expands the world. When I think about a book with dragons, I have to admit I expect high stakes, intense action and that fierce heroine leading the charge. Before She Ignites is the complete opposite of that. There are high stakes but the struggle is far more internal and the heroine is oh-so-slowly discovering her voice. It's a slow-paced book in general and while that isn't always a bad thing, I do think it's wise to temper your expectations if they were anything like mine. Mira Minkoba is famously known across the Fallen Isles as the Hopebearer. She is essentially a politician's daughter, meant to look and act perfect at all times and that's the role she's played all her life. After all, when a peace treaty that united the seven islands against their enemies is named after you, being beautiful and poised is all your meant to do. That is until she discovers a secret that could change everything the treaty and their government stands for. She's thrown in to the Pit, a deadly prison, to be silenced and where she has to struggle to survive every day. While there she's taunted daily by a cruel guard, makes unexpected allies and most surprisingly of all, discovers she can endure this. It takes Mira a long time to decide there's more she can do beyond surviving and when she does, that's when the pace finally picks up (towards the end). 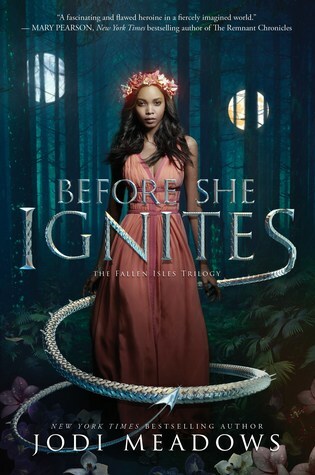 What kept me most interested in the book were actually the secondary characters and their connection to Mira. I was fascinated by her fellow prisoners and wanted more of her two best friends. Do I recommend? I do plan to continue the series but of Meadows' books, this is my least favorite. It felt very much like an introductory book but given the ending, I have high hopes for the second.